Apryl McLaughlin has more than two decades of legal and business experience. She has been a paralegal at Green Bryant & French since 2010, where she uses her financial background to assist in successfully litigating both state and federal cases ranging from financial elder abuse, nursing home/elder abuse to catastrophic personal injury cases. Prior to joining the Green Bryant & French team, Apryl worked at another local firm where her primary focus was in children’s sexual abuse cases. Ms. McLaughlin obtained her Bachelor of Arts degree in Psychology with a minor in criminal justice in 2004 from Chapman University. 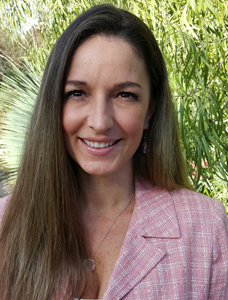 She studied forensic science in graduate school before going on to receive her paralegal certificate from University of San Diego, an ABA approved paralegal program, in 2010. Ms. McLaughlin completed her internship at the California State Attorney General’s Office. Apryl is passionate about her job and seeking justice for the injured plaintiffs she represents. She was born and raised in San Diego where she lives with her husband, a U.S. Navy pilot, and their son, Miller.